Show off your rescue dog with pride when you rock this personalized hoodie! Being a rescue Mom is something to be proud of, and your pet loves you for giving them a happy home. This Pet Rescue Hoodie is available on our premium white, pink and ash gray cotton/poly blend hooded sweatshirts, machine washable in adult sizes S-2XL. Free personalization of any pet name is included. Looks great, can't wait to wear it! just love this hoodie! I get so many compliments on it. Great quality! 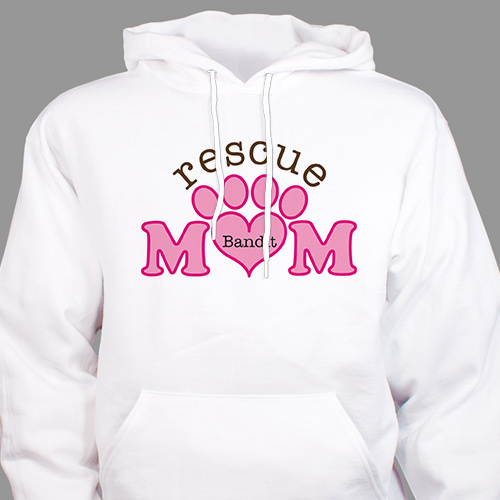 Additional Details Rescue pet Mothers everywhere would love to wear a hoodie like this one! Other rescue parents would love our Personalized Rescue Mom Mug.